DXW-2-RX - Aurora Multimedia Corp. 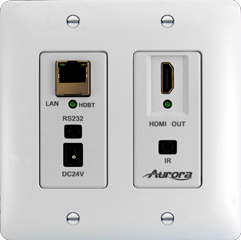 Adding to One Room – One Cable™, Aurora announces two new in-wall HDMI Output versions of their award winning In-Wall HDBaseT product line. The DXW-2-RX series comes in a 230ft and 330/600ft extended version (DXW-2-RX1 & DXW-2E-RX2). The new wall-plates allow installers to offer a clean install behind the monitor without exposed wires and bulky boxes to mount behind the display. The unit is powered remotely from Aurora’s DXE-CAT-TX units as well as their DXM Matrix switchers along with other compatible PoH devices. There is also convenient front and rear panel power connection if required. Units will be available to ship November 1st.